We are mapping international and regional policy processes and fora where issues of gender & chemicals are being addressed, or could be addressed, in order to raise awareness and integrate gender into international chemicals and waste management. Here is a calendar of upcoming events. As mentioned in the introduction, the OPS of SAICM address the role of women and other vulnerable groups. The last progress report for the years 2011-2013 states, that women were targeted by nearly 40% of SAICM stakeholders with strategies for communicating on chemical safety (SAICM 2014). Yet, further research on gender and chemicals and gender-disaggregated data on the effects of chemicals is necessary (UNDP 2011; UNEP et al. 2016; WECF 2016). Since the establishment of SAICM in 2006, the international policy landscape has evolved further: in 2012, the United Nations General Assembly Resolution The Future We Want reaffirmed the specific role and importance of women for sustainable development and since 2015 the 2030 Agenda for Sustainable Development with its seventeen SDGs and 169 related targets explicitly „seek to realize the human rights of all and to achieve gender equality and the empowerment of all women and girls.” (p: 1). Furthermore, the sound management of chemicals and waste is addressed in SDG 3 (Good Health and Well-being), SDG 6 (Clean Water and Sanitation), and, as mentioned above, in SDG 12 (Sustainable Consumption and Production). 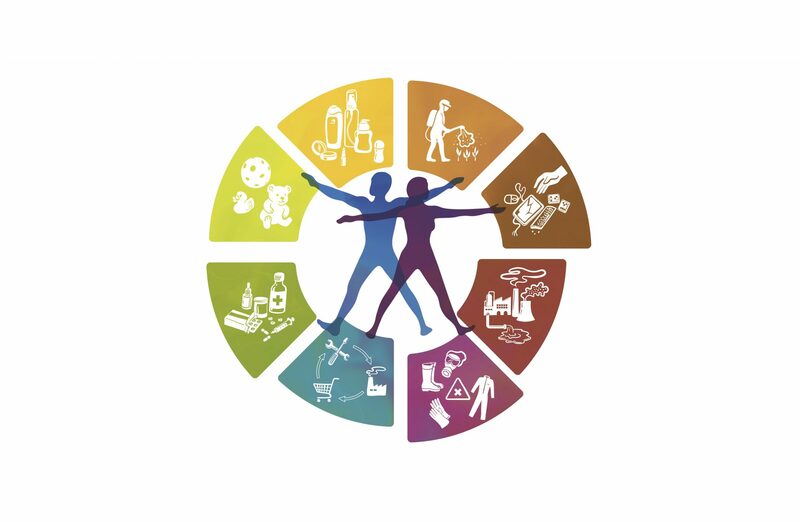 _____ The current process of developing a strategy for SAICM Beyond2020 provides a unique window of opportunity to address the link between chemicals and waste management, gender equality, and the SDGs in a multi-stakeholder and multi-sectoral setting. The IOMC was established in 1995, following the recommendation of Agenda21. 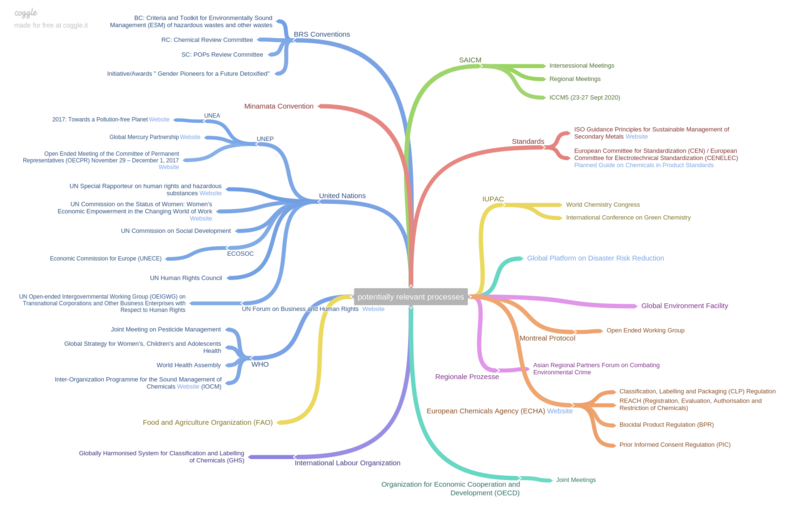 It combines and seeks to harmonize the expertise and individual chemicals programs of FAO, ILO, UNEP, UNIDO, WHO, OECD, UNITAR, the World Bank, and UNDP. It provides an online Toolbox for Decision Making in Chemicals Management, „a problem solving tool that enables countries to identify the most appropriate and efficient national actions to address specific national problems related to chemicals management.“ (IOMC 2017). to the Stockholm Convention contained some sort of reference to women and/or gender (Gilligan, Sabater 2017).While this is an important fact regarding the mainstreaming of gender issues into the implementation of the BRS-Conventions, the Report of the United Nations Secretary-General on Progress Toward the Sustainable Development Goals of 2017, states that „[…] from 2010 to 2014, only 57 per cent of the parties to the Basel Convention on the Control of Transboundary Movements of Hazardous Wastes and Their Disposal, 71 per cent of the parties to the Rotterdam Convention on the Prior Informed Consent Procedure for Certain Hazardous Chemicals and Pesticides in International Trade, and 51 per cent of the parties to the Stockholm Convention on Persistent Organic Pollutants provided the requested data and information. All parties reported to the Montreal Protocol on Substances that Deplete the Ozone Layer“ (UN Sec. Gen. 2017). _____ It seems that overall implementation and especially the reporting mechanisms for the individual conventions require further assistance, specifically for the Stockholm Convention. The International Programme on Chemical Safety (IPCS) of the WHO seeks to support scientific research and strengthen national capacities for the sound management of chemicals (WHO 2017c). It addresses health impacts by providing information and assessment materials and trainings as well as a forum to promote the objectives of SAICM, currently focusing on nanomaterials and combined exposures, among others. Based on a study from 2011, a recent report not only provided estimates for the burden of exposure to selected chemicals, but also exemplified economic benefits of effective interventions (WHO 2016). Similar to the lack of gender-disaggregated data on chemical exposure, this topic has so far only received little attention. _____ Combining both topics could help developing effective arguments for international management of chemicals and waste, based not only on avoiding harm but also on expected benefits. As a Functional Commission of the United Nations Economic and Social Council (ECOSOC) the UN Commission on the Status of Women (CSW) is an inter-governmental body responsible for promoting gender equality and the empowerment of women. Although chemicals management is only considered within the context of the SDGs, the mandate of CSW includes ensuring high-level engagement and addressing emerging issues, trends, and focus areas, among others. This also involves advocacy for leadership and political participation. While CSW provides an important forum at the intergovernmental level, with an outward focus and the advantage of attaining high public awareness, simultaneous engagement with the United Nations Entity for Gender Equality and the Empowerment of Women (UN Women) could support the implementation of respective gender considerations for the relevant Conventions in the UN Member States, especially with regard to technical and financial support. _____ „Challenges and opportunities in achieving gender equality and the empowerment of rural women and girls“ is the CSW priority theme in 2018 and „Women’s empowerment and the link to sustainable development“ a review theme in 2019. Thus, the commission’s agenda provides opportunities to discuss and set the agenda for future priorities concerning gender-specific aspects of international chemicals and waste management during the development of a strategy beyond 2020. UNEP is the main UN entity for environmental issues. The Chemicals and Waste Branch forms a leading institution on capacity and policy instruments, including regulatory frameworks, as well as scientific and technical knowledge and tools. UNEP is also the implementing agency of the Global Environment Facility (GEF). Key resources in recent years included the Global Gender and Environmental Outlook (UNEP 2016) and the Global Chemicals Outlook (UNEP 2013). With regard to gender-specific issues the GGEO presented the first edition of its kind. _____ The 3rd United Nations Environment Assembly (UNEA-3), being held in Nairobi in Dec 2017, is addressing the overarching theme of pollution: “Towards a Pollution Free Planet”, and gender needs to be integrated in all relevant resolutions. _____ The next edition of the Global Chemicals Outlook, currently being prepared, should specifically include gender-disaggregated data. The ILO addresses gender aspects as one area of work considering occupational health and safety. An information note in 2010 specifically considered the mutagenic effects of certain chemicals as well as the high representation of women in micro-electronic manufacturing jobs in developing countries resulting from new technologies and the corresponding transferal of production facilities (Forastieri 2010). Although the most relevant Convention No. 170 on Safety in the use of Chemicals at Work (ILO 1990a) does not mention women or gender, the respective Recommendation No. 177 recognizes the specific right of pregnant or breastfeeding women to alternative work that would not harm the child (ILO 1990b). ____ Further disaggregated statistics about women’s participation in different sectors could help to close the existing data gaps and support further research about gender-specific factors of employment and chemical exposure.